The first consideration in establishing a motivating writing routine is to make sure it is one that you will want to follow, and you may need to experiment to find out just what that is. What time of day do you work best? Do you prefer to be alone in a room or in a crowded coffee shop? Can you work just as well with your family all around you and the TV on? Do you prefer music or silence? Work out as many of these variables as you can, and within the parameters of your existing obligations and lifestyle, choose a time and place for writing that is as ideal as you can make it. Setting yourself up to succeed is motivating in and of itself, and if you hate writing at the crack of dawn or while you are all alone, you are much less likely to stick to your routine if you try to force yourself to do it in a way that is unpleasant. Developing a ritual around your writing isn’t just an indulgence. It can provide your writing brain with the cues it needs to start shifting into action. A ritual can be as simple or as complicated as you want it to be. It may involve nothing more than changing into a comfortable outfit and making yourself a cup of tea. It might mean sitting in the same spot at the coffee shop with the same drink each day. It might mean lighting candles and meditating for five minutes, going for a brief walk or run or reading over the previous day’s writing. The specifics of your are unimportant. What matters is that they are meaningful for you and that doing them will begin to create writing habits that help you stay in a creative frame of mind. Some people find that setting a writing date to work with a friend, either online or in person, can be an excellent way to motivate themselves to write. These regular dates create a kind of positive peer pressure and help to ensure that even if writing is not happening as regularly as it should, it is at least getting done on days that dates are set. Writers who can meet in person often meet at a coffee shop and set a certain amount of time to sit and write. They can agree on whether they want to share their work afterward. With online writing buddies, if you cannot coordinate writing times, you can set up some kind of check-in system such as dropping one another a text or an email at the beginning and end of a writing session. For additional motivation, writing partners can challenge one another to reach certain word or page counts or find other ways to develop a competition to keep them going. If you don’t know how much you have done or how much more you need to do, it can be much more difficult to motivate yourself. Making a plan and tracking your progress is an important aspect of knowing where you have been, where you are going and what you need to do in any given writing session. For example, let’s say that you want to write an 80,000 word novel, and you plan to write 500 words per day working 5 days per week. At 2,500 words per week, it will take you 32 weeks to finish your first draft. You can set up a spreadsheet to monitor your progress and note whether you meet your daily and weekly goals. You can make the spreadsheet as simple or complex as you like, using formulas to calculate what percentage of your novel you have written or how many words you have left for the week. Watch the word count slowly move upward as you get closer to your goal and you’ll find yourself getting motivated. Having a set number of words to write each session can help you establish your routine. You may also find along the way that you have set your goal too high or too low, and you can adjust accordingly. Rewarding yourself is an excellent way to increase your motivation. While it is true that writing regularly as well as the longer-term reward of finishing your novel can help motivate you, these are not always immediate rewards, and they don’t always work when you are looking at yet another writing session during a time when you have felt tired and unmotivated. 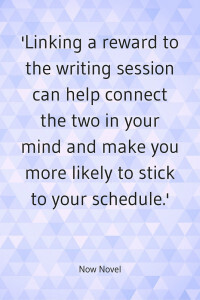 Linking a reward to the writing session can help connect the two in your mind and make you more likely to stick to your schedule. Eventually, aside from any actual pleasure in writing, you will come to associate the reward with the writing session and be more eager to write. If rewards are not motivating enough, there are plenty of apps for writers that can help you form good writing habits. One fun one is Habitica. Habitica ‘gamifies your life’ by turning tasks into monsters and giving you credit for defeating them. StickK requires you to donate actual money if you fail to meet your goals. Other popular apps include Coach Me and Balance. One important thing to consider about using an app for motivation is that you should enjoy using the app. An app that becomes just another chore on your to-do list is unlikely to motivate you, so try a few and choose wisely. All of the above suggestions are for nothing if you don’t protect your writing time. Even the most well-meaning family members and friends will often try to distract you from your work, and it is important that you train them to understand that the time you have chosen for your writing is non-negotiable. This means turning off your phone, disconnecting from social media and refusing to respond to people unless a true emergency arises. You must begin to think about writing as a part of your day that is as important as your day job or making sure your family is fed. You wouldn’t simply avoid doing those things because you were busy, tired or distracted, and your writing must occupy the same position of importance in your life. 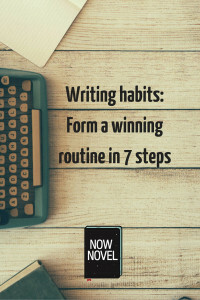 Developing a routine is important because writing becomes a regular part of your life rather than something you are trying to fit into an already-busy schedule. 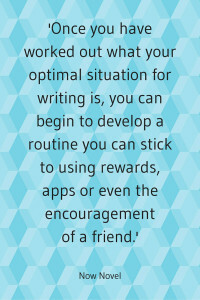 Once you have worked out what your optimal situation for writing is, you can begin to develop a routine you can stick to using rewards, apps or even the encouragement of a friend among other methods. Have you worked out your central idea for a novel yet? Does it need more finessing? Use the Now Novel ideas finder to get the central idea for a novel into words.